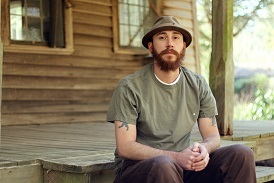 AM: We’re thrilled to interview you at Southern Literary Review, David. Thank you. Your novel is Where All Light Tends to Go, a story about the underbelly of North Carolina, where outlawing is, the opening lines tell us, “as much a matter of blood as hair color and height.” Tell us how Jacob McNeely, your narrator, came to be. DJ: I saw Jacob before I heard him. And what I mean is that there was an image before there was a voice. I was at a buddy’s house up in Cashiers and we were standing by his hog pen where he keeps these feral hogs he traps and he was telling me about how, when they’re hunting, they kill some of the hogs with a knife. They bay the hogs with hounds and when the dogs get the pig down the hunter will go in and stab the hog in the heart. So while he was telling me this, an image came into my head, an image of a really young boy doing this. I saw a boy with his father standing behind him telling his son what to do, and this boy watching the light go out of this animal’s eyes and suddenly realizing just how much power a person had over life and death. That image stuck with me for a long time, and I kept trying to write his story, but I kept getting it wrong. I think I kept trying to force it rather than let him tell me what he wanted to tell me. Then one night I woke out of a dream and Jacob was talking. That’s when I finally got it right is when I stopped trying to force it. I seemed to get it right when I started listening. AM: You and I are about the same age. We were both born in 1983 at any rate. You must write about the places you know, as the North Carolina setting tracks your own paths through that state. How did the region shape and influence your fiction? DJ: North Carolina is the place and the people I know. Until this past year, I’d never really gone anywhere outside of the state. You can trace my family back in every direction and pretty much as soon as my ancestors got off the boats in Virginia they headed to the piedmont of North Carolina. This goes back to the 1700s. They were poor cotton farmers and tobacco farmers mostly. I’m very much rooted to this state and this place. But about twelve or thirteen years ago, I wound up moving to the mountains and I think a lot of that had to do with finding a very familiar value set that still existed in Appalachia, but that was quickly disappearing where I grew up. The people in the mountains remind me of my grandmother who grew up on a cotton farm and who had this very deep-seeded vein of storytelling and people and culture running through her. Us Southerners are lucky in that sense, in that we come out of a very rich storytelling tradition. The writers I’m most influenced by, writers like Larry Brown and William Gay and Ron Rash and George Singleton and Harry Crews and going back to folks like O’Connor and Faulkner, all of these people are coming out of a Southern storytelling tradition. All of these writers are focused on the lives of working class people doing the best they can. Those are the footsteps I’m following, and I think that’s how this region and this place shape my work. AM: There’s an element of class in the book that interests me. Jacob refers to himself as “trash” in the eyes of his peers. His dad deals crank and is covered in tattoos—not exactly markers of the upper echelon. His dad’s girlfriend has rotting teeth. His dad and his mom talk in slang, with accents, and cuss like sailors. By contrast—and maybe this is just because it’s graduation—when we first meet Maggie Jennings she seems the debutante type: wearing high heels and a white sundress, standing with the ostensibly “perfect American family” that, in fact, is living a lie, according to the narrator. What’s going on with class in the novel? Cashiers has some of the highest-end country clubs and gated communities in America. When I was writing this book, I was working two jobs and the second job was at a recreation center where Andy Roddick would come in and play basketball. That’s the type of wealth that is in Cashiers in the summer. But at the same time, you’ve got families who go back to the first land grants. You’ve got names like McNeely and McCall and Dillard and Fowler and Farmer and Dills and Aiken and Rice that go back generations. These are salt-of-the-earth, working-class people. The type of stratification I’m talking about is honestly mindboggling. You’ve got ten million dollar homes with copper roofs right across the holler from people who are stripping the wire out of houses just to make ends meet. You’ve got people who drive hundred thousand dollar cars to a grocery store where the folks working can barely afford what they’re stocking on the shelves. You’ve got hunting dogs running bear across the fairways of Tom Fazio-designed golf courses. That’s where this novel is set. And those are the class issues at play. AM: Let’s talk about drugs. They’re an important part of the book. Readers might have a discussion about the political, cultural, economic, and social effects of drugs in Jacob’s life. DJ: Where I grew up and for the types of people I write about and am interested in, I think drugs represent two things. On one hand they’re a source of money, an economic means for getting things that you otherwise wouldn’t be able to have. But at the same time, they’re also self-medication and a way to escape, albeit briefly. We see both sides of that in the novel. We see Jacob growing up in a household where his father sells methamphetamine, and where Jacob is being groomed to do the same. And at the same time, we see Jacob’s mother is an addict, Jacob is abusing prescription drugs, and his father’s taking painkillers and drinking. I think I write about these things because it’s what I grew up around. It’s real to me. I’m certain it comes off as extreme to some, but it’s been the reality of most the people I grew up with. These are very real problems and when you’re writing about lower working class lives it’s unavoidable. I’m not interested in lives where everything pans out. I’m interested in lives where everything falls apart. I’m interested in how people try to navigate a world where the odds are stacked against them. The ugly truth of that reality is that oftentimes the world is just too heavy a place to bear. AM: The plot involves the murder of Robbie Douglas. You do a fine job of walking the lines of genre. This is both a popular thriller and a work of literary fiction. Were you mindful of this tight rope walk as you pieced the book together? DJ: I was definitely conscious of how I wanted the narrative to move, and I think that’s why it meant so much that Daniel Woodrell said the novel had “a graceful but restless pace.” He’s one of my idols and in a lot of ways he was the writer I was trying to emulate. A novel like Tomato Red, you read the opening line and you’re at the end of the first chapter before you come up for air. I remember the first time I read that novel, I spent an entire day reading the opening chapter over and over trying to figure out how he did it, how he was able to hold me in the palm of his hand. Daniel’s definitely a master of that, especially with that stretch from Tomato Red, Death of Sweet Mister, and Winter’s Bone. Barry Hannah’s another that comes to mind. Larry Brown does this with Father and Son. Donald Ray Pollock is another. Even someone like Ron Rash, who I think is writing some of the most poetic fiction in America, you can look at the stories in a collection like Burning Bright and you can see how he’s in full control of how fast the narrative is moving. All the writers I really admire are very aware of that pedal. They know when to hit the gas. AM: Your second novel is forthcoming. You’re probably still wrapping it up. Before I ask about it, I’d like to know a bit about your writing habits: your schedule, where you write, how often—that kind of thing. I think that idea of fits and starts, and that idea of long spells where I feel like I’ve never written anything in my life and then all of it suddenly surging out at once is something that is very much definitive of my process. And just like Carver said, I’m trying to get to a place where I’m patient and trust in knowing that the story will come. Silas House said one time that he writes 24/7, and what he meant by that was that even when he’s not putting words on the page, he’s thinking about things. He’s thinking about characters, picking up little pieces from the world around him, and all of that eventually makes it into the story. So for me, it’s important to remember that the times when I’m not writing are just as essential, maybe even more so. My process is also evolving in a lot of ways because of deadlines, and I find that I work much better at night. When I’m really cooking with gas seems to be from about midnight to somewhere around five in the morning. When the writing is coming like that I keep really strange hours. Usually I’ll get up around nine in the morning and work till lunch, eat lunch and then nap for an hour or two. Then I’ll work till supper and take another nap. After that I’ll work all night until about five. I’m usually sleeping seven or eight hours a day, but it’s broken up into all these small segments of time. You might find me pacing the front yard or walking down the road at four in the morning. Makes it hard to have friends, I guess, but I’m kind of an odd duck anyways. AM: And the novel you’re working on now—it’s tentatively titled Waiting On the End of the World. What’s it about? Do we return to North Carolina? DJ: Right now, I can’t imagine writing anything set outside of North Carolina. That’s just the landscape and people that I know. Like I said earlier, until this past year, I’d never really been outside of the state. But to answer your question, yes. The new novel is set in North Carolina, and once again it’s set very specifically in Jackson County where I live, this time in a community called Little Canada. I have a hard time answering what a book’s about. That always seems like a philosophical question and to steal a line from Donald Ray Pollock, “I’m probably the least cerebral guy you’re ever going to meet as a writer.” But I think the big picture is that this new book is about trauma and how different people cope with trauma, how the things we witness, the things we carry, come to govern our lives. As far as what happens in the book, or the trigger for the narrative, there are these two best friends, Aiden McCall and Thad Broom, who go to buy drugs and wind up witnessing the accidental suicide of their dealer. All of a sudden a riot of meth and money lands in their laps and what ensues is a meth-fueled race toward disaster. That’s the set up. AM: Thanks for this interview, David. What’s the best way for readers to follow you and keep up with the novel and your goings-on? DJ: At the advice of folks who know much more about such things than me, I’ve got accounts on Facebook and Twitter and Instagram and you can get to those from my website, www.david-joy.com. My website is also a good place to see where I’ll be for readings and events. I love meeting people and talking books and hearing stories so that’ll always be the best way is just to come hang out at an event at a local bookstore or somewhere. Plus, if it’s a real honest-to-god, face-to-face conversation, we can drink beer afterward and that beats the hell out of computers. AM: Again, thank you. All the best. Great interview–it made me want to read this book.